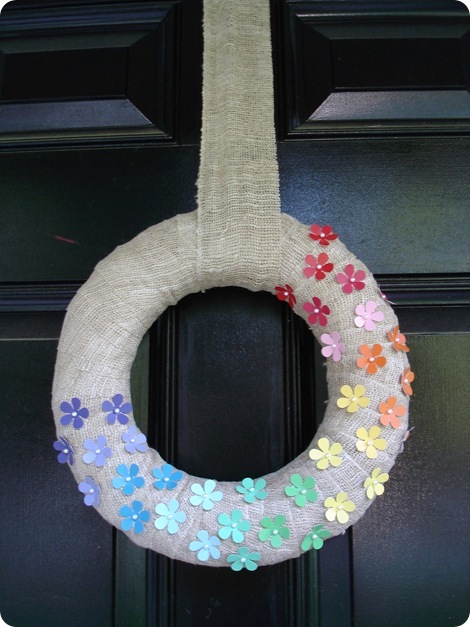 I wanted something simple, colorful and fun, and this wreath has all that in spades. 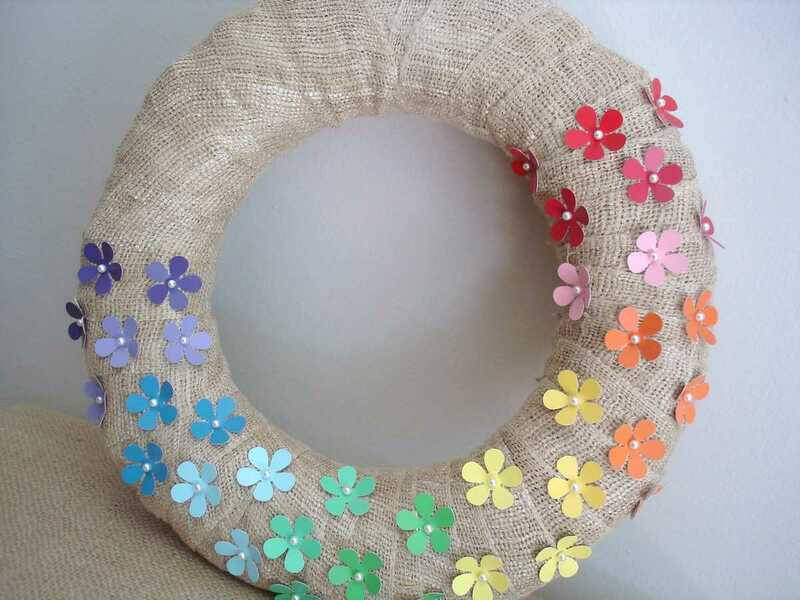 Step 1: Wrap your wreath with your fabric of choice, and punch out your flower shapes (a butterfly punch would make a sweet wreath as well). I wanted a rainbow effect for mine, but any color palette would work! 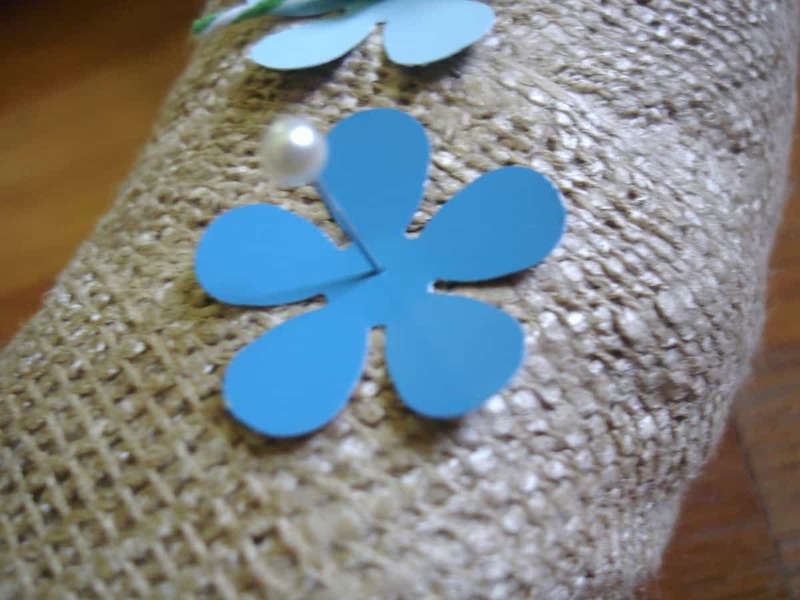 Step 2: Using your pins (mine have a pearl head), attach flowers to your wreath form. I also bent the leaves of my flowers slightly to add a little bit of dimension. 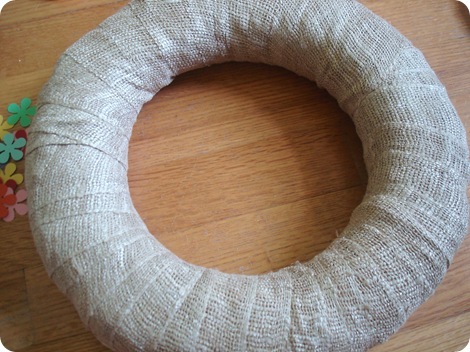 Step 3: Continue around your wreath, pinning and bending until you’ve reached your desired look. That’s it! Just hang and admire! Thank you so much for letting me share my wreath here today! Thanks, Linda!! I love the thought of using paint chips! Since you used pins to hold the flowers on, it seems like it would be easy to switch it out for different holidays. 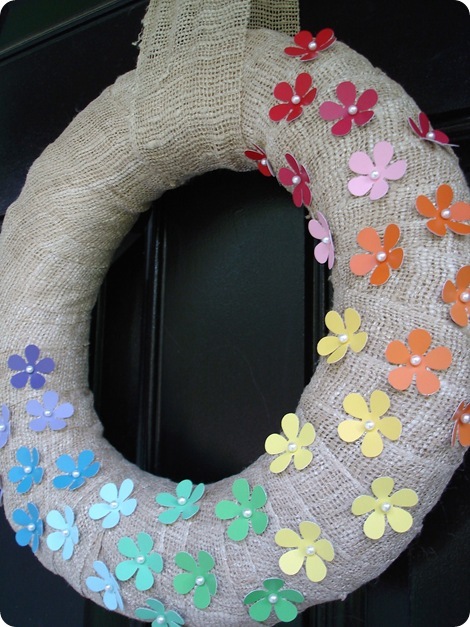 You could pin leaves for Fall or blue snowflakes for Winter without creating a whole new wreath. Check out Linda’s blog and Etsy shop…you’ll love them! That’s for introducing us to Linda. I linked over and checked out her blog and Etsy shop. She is very creative and has amazing items in her shop. I love the wreath project; seems easy. Can you change out of the flowers for each season? Such a lovely idea, I love that it can be interchangeable for different seasons/holidays! .-= Liz´s last blog ..pillow covers =-. 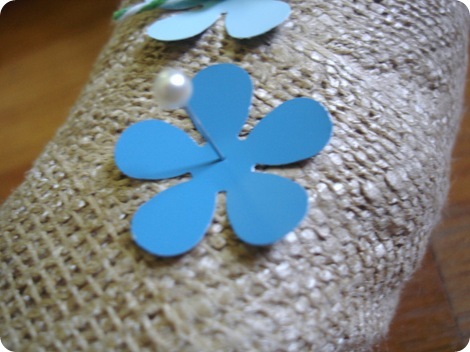 .-= Shirley L´s last blog ..Pretty Package =-. Sweet, simple and super cute!! .-= mom taxi julie´s last blog ..Pismo Beach I :HEART: You!! =-. I know I can do this! I may do a similar wreath with fall leaves! Thank you! .-= Michelle´s last blog ..Metal Stamping Set With Case – 1.5mm 36 Piece Letters And Numbers =-. So so stinkin’ cute! My mom brought me some burlap from a project she was doing and now I can use it for this project. Thanks for sharing? Love this wreath and already planning on making one after the upcoming wedding festivities for daughter are over. We used that same punch to make kissing balls to hang at the wedding and they turned out adorable! .-= Jo´s last blog ..Growth in HID Grow Lights =-. I love this, so simple and so elegant. You can then change out the paper colors for holidays! I am thinking of all kinds of punches like the Martha Stewart Embossed pumpkins and little ghosts for Halloween now! .-= cindy´s last blog ..Free Ocean Octopus Dolphin Etsy Shop Banner! Fun Theme! =-.